How much horsepower does a 383 Stroker make? - Mechanic Guides! One amazing question that comes along every day is how much horsepower…? And the rest is blah blah. Honestly, horsepower is not everything, and in fact, if you overpower your vehicle without prepping it properly, you end up getting too much horsepower and not enough to back it up. Check this out. Instead of asking how much horsepower a 383 Stroker make, you should ask how much horsepower do I need from my 383 Stroker. You can get 300, 400, 500 what it you want is? Pick a number. Now, to choose the right horsepower, you have to know what you are driving for. Here are the four levels of driving and their horsepower requirements. The daily driver, you require a smooth idle with a Factory to slightly Modified Engine. This means you only need to pump out of your 383 a range of 230–275 HP. A cruiser needs a more aggressive idle and wants more added torque and punch, as such, you want a horsepower range of 275-350. The racer wants a racier sounding idle with an increased low to mid-range horsepower and torque. As such, you want to be placed between power and street performance, and this means you need between a 350 to 475 HP Range. The final driver is the hot rod, the showpiece, the noise machine and you want a Choppy Idle for Street and Strip use. This comes with a big camshaft and a high compression ratio, and everyone knows you have arrived since you sound like you make over 500 HP. Bear in mind; powerful cars are usually light, this means that they respond to mild enhancements with exponential effectivity. The average weight of such a powerhouse would be around 2,000 lbs. Remember, the bigger the camshaft, the choppier the idle and the harder it is to maintain. In fact, having a choppy idle is a lot of hard work and constant tuning. Only go this way if you intend to walk around with a tool belt around your waist. Take note that the higher the compression, the less street worthy the motor. Keep your compression ratio between 9 to 1.5 to 1, and don’t go over this. If you go higher, you end up getting hotter engine temps, pre-ignition issues and even detonation problems. If you go big, you need to have an oil cooler, and this is because the bigger the power, the hotter the engine and water pumps sometimes just don’t cut the mustard. When you go for more horsepower, you need to match the components to support the new output. As such, upgrading a 383 (or any engine for that matter) requires you match the whole system, and that includes upgrading the Clutch and the transmission, the Rear End, and the Suspension, the Braking and Cooling Systems and more. So truly ask yourself, how much horsepower do you need, and not how much horsepower can the kit give you. Apart from all the components used to make a 383 reach the desired horsepower, its time to take a look at a 383 Stroker engine. A 383 Stroker is a great model to use, and it’s because it’s really a 350 with wider bores. As such what you are getting is a 350 that provides you with performance ratings such as 0 to 60 in 3.9 seconds. Raising the horsepower to over 450 and developing over 460 lbs of torque. Upgrade the carb, consider that a 383 Stroker needs an 800 cfm carb to deliver over 450 horsepower. 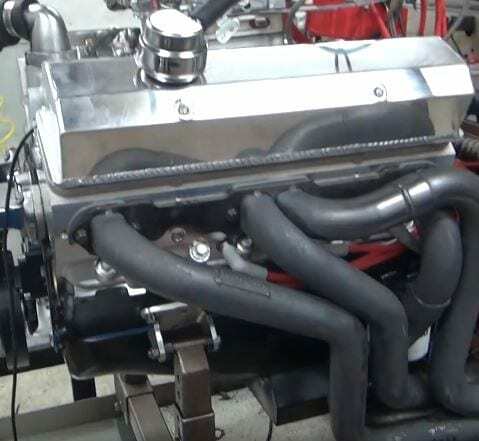 Change your cast iron heads to lighter aluminum heads with larger intake and exhaust runners as well as bigger valves. If you match these with the right camshaft, you end up adding 100 horsepower easily. These are just a few options that can raise your 383 Stroker horsepower.